When I go to garage/rummage/tag sales or flea markets, I take a list of items I’m interested in finding. There’s a show on A&E called Find & Design and every episode the host gives the same advice. 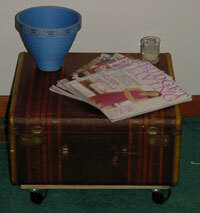 A couple years ago, I was eager to find a hard-side luggage to make into a low end table that would provide storage. I lucked upon this one and since it was missing its strap, I talked them into selling it for $3. Even better, when I asked my dad for a piece of scrap wood to serve at the base, he rounded the corners for me! I picked up 4 casters for about $12 total and screwed them into the bottom. Then, using hook and loop tape (most people know this product by a brand name – do you know what it is?!) I mounted the luggage to the wood base. My reason for using the hook and loop tape was that I didn’t want to glue or drill holes into the luggage and knew I would be able to remove the tape if I wanted, but I haven’t! way too cool. nuff said.